One of Downtown’s busiest shopping and dining destinations, FIGat7th hosts movies, music and seasonal fests in its recessed plaza. The shopping center includes retailers like Target and Zara, a food court and Downtown outposts of Sprinkles, Mendocino Farms and Pazzo Gelato. Mon-Fri 11am-9pm, Sat-Sun 11am-7pm; Target, Gold’s Gym, H&M, Zara and some restaurants offer extended hours. 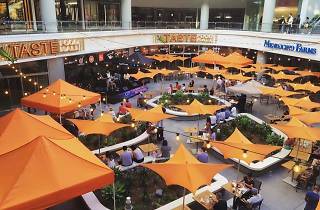 FIGat7th is one of the few spots where you can go shopping and have a meal concentrated in one place, concerning DTLA. It's actually a nice place to go, because you can also find, at the top, a green garden, with some benches and tables, where you can sit and eat or just read a book. They also use the place for a farmers market on Thursdays. FIGat7th is right across the street from my work, making it super convenient when I'm looking for lunch or need something from Target. 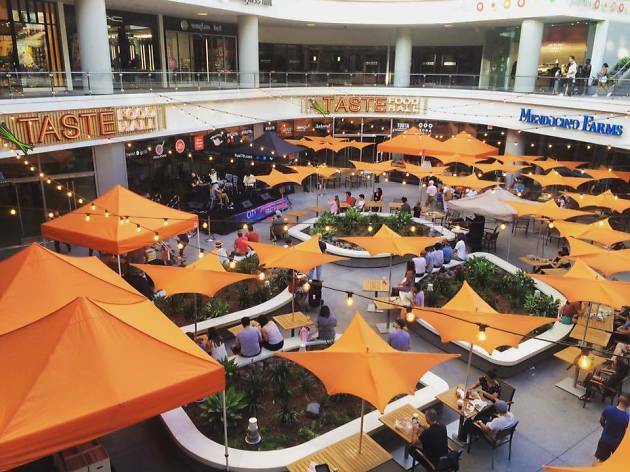 The food hall has some great options and Mendocino Farms is also one of my top choices (though the line is often out the door!). Grateful this place is so close to my work!